Members of the 4 regional agencies and representatives from National Disaster Offices getting ready for the exercise (from left to right: Philmore Mullin (NDC, Antigua & Barbuda); Lorraine Francis (CARPHA), Mandela Christian (CDEMA), Nadine Bushell (CARICOM IMPACS), Claricia Stephens (NDC, St. Kitts & Nevis), Captain Brian Roberts (RSS), BG General (R) Earl Arthurs (CDEMA) and Joanne Persad (CDEMA). 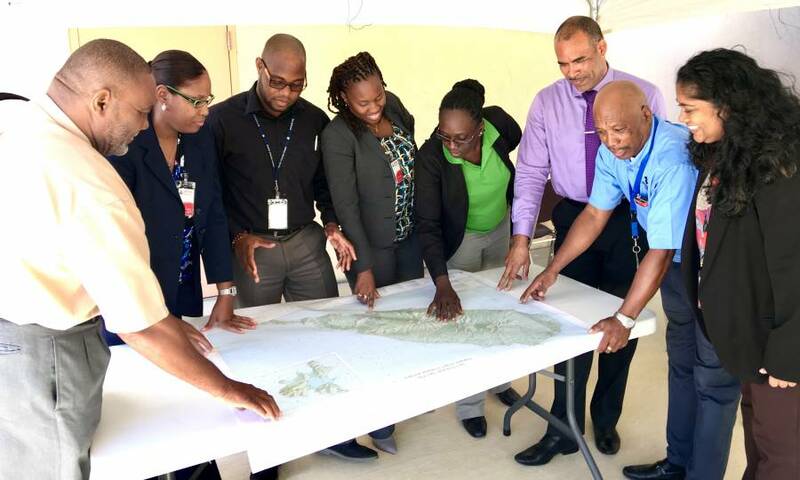 Security, public health and disaster management personnel from across the Caribbean were put to the test, as they participated in a training exercise aimed at improving regional responses during an emergency situation. The exercise, Synergy 2017, presented emergency scenarios that could occur in the Caribbean region. The exercise took place from 11 to 12 January at the Caribbean Disaster Emergency Management Agency (CDEMA) based in Barbados. The exercise was designed to assess and evaluate preparedness and require the participants to work together to provide public health, disaster and security responses; as well as aid in the revision of existing Standard Operating Procedures (SOPs) for use in real-world responses. The emergencies described are simulations only. Synergy 2017 is the result of a series of detailed planning conferences involving personnel from the Caribbean Disaster Emergency Management Agency (CDEMA), the Caribbean Public Health Agency (CARPHA), the CARICOM Implementation Agency for Crime and Security (CARICOM IMPACS) and the Regional Security System (RSS). It is sponsored by the Global Crisis Response Support Programme of the European Union. Synergy 2017 is a historic emergency coordination exercise with participants from regional institutions based in Barbados and Trinidad and Tobago. The responses are co-ordinated through a Virtual Crisis Room, made up of personnel from the four agencies collaborating in a virtual environment.